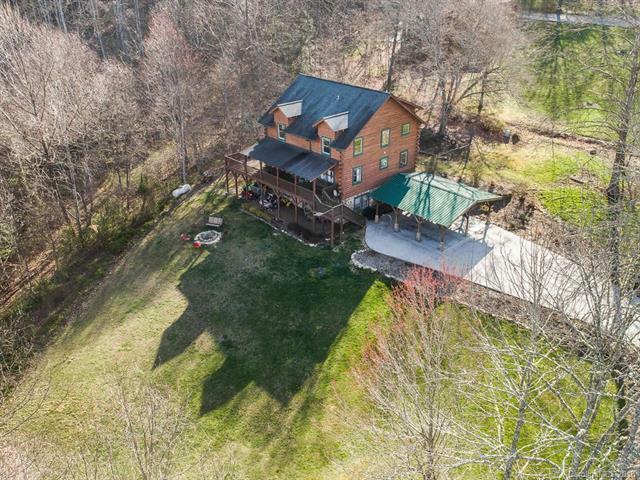 This spacious, well maintained 3 BR, 3 BA log home can be the cozy cabin of your dreams. It boasts a large, sun soaked lawn nestled on 1.38 acre lot with lush, mature hardwoods. This home has large covered porches where you can enjoy the sweet mountain air, a beautiful stacked stone fireplace, vaulted ceilings with a large loft overlooking the great room. Relax in front of the fire with a good book and an adult beverage. The kitchen offers double wall ovens for the person who loves to cook or bake. The second living quarters downstairs features a kitchenette and private entrance, with a bonus room that can be used as a bedroom. Outside features a covered parking area, firepit and place for a playset or swing set. Lots of usable exterior space, including a storage shed. Some furniture is negotiable. Located close to downtown Waynesville, Maggie Valley, Harrah's Casino, Lake Junaluska and BR Parkway. This property could make a great investment for a VRBO or Air BnB. More pics in video.